Dr. Grace J. Rebollos (extreme right), WMSU President served as a resource person during the videoconfab seated together with (from left) host Ms. Baicon Macaraya and guest Prof. Jane Ruby J. Asperin of MSU-Marawi. The social networking fad has seen glare of publicity in today’s generation. Technology has brought a lot of bliss to the world. But have we really reckoned the role of technology in society? The Center for Peace and Development (CPD) in partnership with the Peace Technology (PeaceTech) and Peace Advocate Zamboanga (PAZ) realized one very important function of high technology today: it can be a medium to propagate peace. 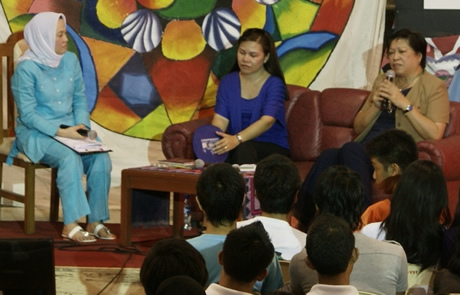 In a Mass Videoconference, the organizers gathered more than two thousand out-of-school youths from different organizations, high school and college students from the different schools and universities in Zamboanga City and Basilan, accompanied by the more than 100 teachers and more than 50 guests from the Department of Education (DepEd) at the Juanito Bruno Gymnasium, Western Mindanao State University last December 1. The videoconference was a talk-show activity between Manila and Zamboanga young people. This has served as a perfect rendezvous for the youth to discuss the different issues of the country regarding peace, violence and discrimination. An active peace advocate, Ms. Baicon Macaraya hosted for the Zamboanga group and the famed singer-actress KC Concepcion hosted for Manila’s end. Two guests shared their real-life accounts of violence and discrimination. Prof. Jamail Kamlian and Prof. Jane Ruby J. Asperin in Manila and Zamboanga, respectively, told their experiences which gave the participants some insights and better understanding of the reality of discrimination and violence. Order high quality essay services at http://globalessays.org by the best writers. Prof. Kamlian, a professor at Mindanao State University-Iligan Institute of Technology (MSU-IIT), retold a story of how he was discriminated as a Muslim and how this affected not only his life but, most of all, of his growing children. He said that the discrimination was very apparent when a subdivision in Cagayan de Oro City owned by a known political figure imposed a No-Muslim Policy within the premises of the said property. This was to him very disheartening. Another story came from Prof. Asperin, a History Professor of the Mindanao State University (MSU). She also retold the painful story of how her military brother was unjustly killed by order of the local authority in Marawi City. But despite this tragedy, she continues to be a peace advocate and still manages to teach at the MSU-Marawi. During the program, additional two other guests served as Resource Speakers. In Zamboanga, it was Dr. Grace J. Rebollos, the WMSU President who elucidated on discrimination, violence and peace issues. On the other hand, Mr. Luisito G. Montalbo, the Undersecretary of the Office of the Presidential Advisor on the Peace Process was the speaker in Manila. In preparation for this event the organizers trained two hundred volunteers to serve as facilitators. The training included facilitation, stage organization, and technical production. The group of volunteers is composed of youths from various groups, in-school and out-of-school.